Be the first to share your favorite memory, photo or story of Garrett. This memorial page is dedicated for family, friends and future generations to celebrate the life of their loved one. Garrett Wade Pollister, age 32, passed away in his home on 43 Chestnut Street in Foxborough. Beloved son of Louis and Marilyn Pollister. Garrett was born in Norwood on January 10, 1986 and was raised in Foxborough. He was a graduate of Foxborough High School, Class of 2005. 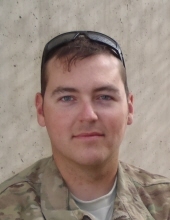 After High School, Garret enlisted in the US Army and served in Iraq, Afghanistan and just recently Africa. He was employed as a Corrections Officer at Walpole Prison. An avid outdoorsman, Garrett enjoyed skiing, hunting, snowmobiling and hiking. He was a loving and devoted son and brother. Loving brother of Robert Dunton and his wife Wanwilia of Foxborough, Kurt Pollister of Foxborough, Jean Axon and her husband Jay of Millville, Cheryl Moitoza and her husband Peter of Taunton and the late Ann Willis. He also leaves behind uncles, aunts, nieces, nephews and many cousins. Relatives and friends are kindly invited to attend calling hours on Monday, September 10 from 2 to 4 and 7 to 9 PM at the Roberts and Sons Funeral Home, 30 South Street, Foxborough. A funeral service will be held on Tuesday at 11 AM at the Bethany Congregational Church, 3 Rockhill Street, Foxborough. Interment to follow at Rock Hill Cemetery in Foxborough. For additional information please contact 508 543-5471. To send an online condolence please visit the funeral home web site at www.robertsandsonsfuneralhome.com. In lieu of flowers, donations in Garrett’s memory may be made to American Gold Star Mothers Inc.
"Email Address" would like to share the life celebration of Garrett Wade Pollister. Click on the "link" to go to share a favorite memory or leave a condolence message for the family.